Warehouses are the heart of every volume based business. This means that to get the most out of your business, you should endeavor to optimize your inventory and warehousing processes to produce great results, increase productivity and enhance organizational efficiency. The following are some of the key warehouse technologies and equipment required to help you get the most out of your business and ensure a smoother running business operation. Without these, running your warehouse, meeting customer demands and effectively filling orders would be borderline impossible. These help with transporting inventory from one part of the warehouse to other parts. Without these workers would have to manually lift and transport equipment and products every minute throughout the day. While that might work for smaller/lighter products, this will not work for heavy equipment. Besides, there’s no way anyone can work all day carrying stuff from one point to the other –not in these tech driven days. Forklifts are part of a group of equipment called industrial warehousing trucks. Another popular motoring equipment is the hand pallet truck. They are often called by other names like pump trucks, pedestrian pallet trucks, and pump jacks. These are great because they are highly efficient and aren’t expensive to purchase –starts at about $260 per unit. These help with the transfer of varied pallet sizes and weights. There are hand pallet trucks for empty pallets and those for transferring over 2 tons of goods. It is considered the most popular warehousing tool. Having these trucks in your warehouse will go a long way in improving worker efficiency as well as prevent the workers from sustaining severe injuries associated with manual load transfer. Many of these industrial trucks can also have flat surfaces or forks. Depending on their use, you can either drive these trucks or push them from point A to B. Some other examples of industrial trucks include order pickers, platform trucks, stack and non-stack trucks, pallet jacks, pallet trucks, and sideloader among others. 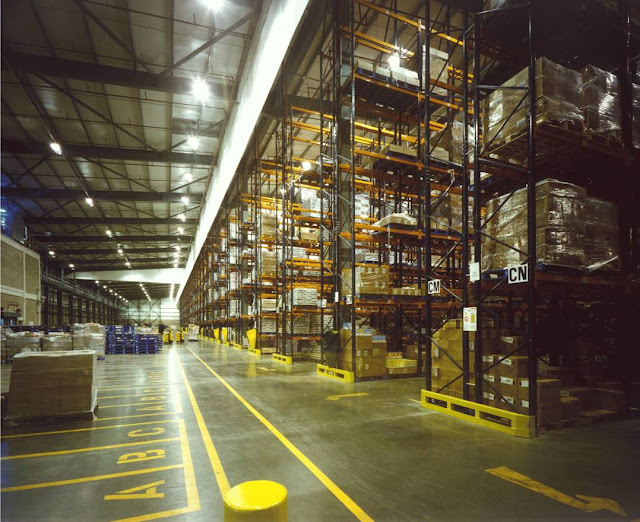 Storage equipment are a crucial part of your warehouse’s success. Without them, there will be chaos in the warehouse and possibly frequent accidents. These are used to holding inventory when they aren’t being moved from one place to the other. These serve as both short term/temporary storage facilities for items that are in between “uptimes” or long term storage facilities for inventory that the organization wants to stockpile. These are usually in the form of racks, shelves or pallets. Here, the products are methodically arranged to they can be easily located and found when necessary. To increase productivity and space saving, however, some firms create their own specific packaging instead of relying on stock systems. Some good examples of these storage equipment are sliding racks, pushback racks, drivethrough racks, pallet racks, shelves, stacking frames, drawers, mezzanines, and bins. These are another group of equipment necessary for the smooth running of any warehouse. They function in both transportation and storage capacities. They have an edge over other storage systems because they are largely automated. Automated Storage and Retrieval Systems (AS/RS) for instance, are an example of these engineered systems. These are often in the form of automated aisles, shelves, and racks. These can be easily accessed courtesy of what is known as a shuttle, essentially enabling any worker to quickly locate and find a product and recover it for whatever uses they see fit. These equipments save time, increase worker productivity, and lowers product mix-up incidents. These are the most important and basic warehousing technologies required to run your warehouse seamlessly and efficiently, whilst boosting worker productivity and results. There are many companies such as, Vertical Storage, who offer a variety of warehouse storage and shelving systems.